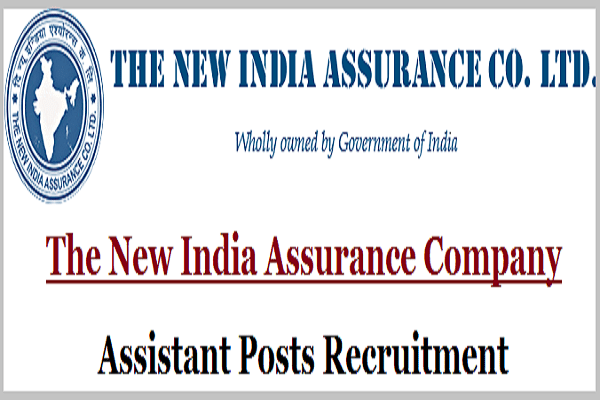 The New India Assurance Company 984 Assistant Posts Results: Recruitment of 984 Assistant Posts, The New India Assurance Co. Ltd, NIACL Recruitments, Jobs in NIACL, NIACL Various Posts, The New India Assurance Company 984 Assistant Posts Recruitment 2017. NIACL Assistant Posts: The New India Assurance Company Limited it is wholly owned by Government of India, having network of offices / business centres in every nook and corner of the country and overseas. NIAC Mission is develop General Insurance Business in the best interest of the community and provide Financial Security to Individuals, Trade, Commerce & all other segments of the Society by offering Insurance products & Services of High Quality at affordable Cost. The NIACL has issued a recruitment notification on 01-03-2017 and invites applications from the eligible and interested Indian citizens for the recruitment of 984 Assistant Positions in its offices and micro offices. The New India Assurance Company Limited would coordinate the written examination, thereafter, interview and Computer Proficiency Test for the short-listed candidates would be conducted by the company in the respective zones where regional offices are located and eligibility pertaining to category, nationality, age, educational qualifications et as indicated in the online application. Online Registration Starts on: 06-03-2017. Online Registration closes on: 29-03-2017. Payment of Application Fees: From 06-03-2017 to 29-03-2017. Date of Preliminary written examination (Tentative): 22-04-2017 and 23-04-2017. Date of Main examination (Tentative): 23-05-2017. The New India Assurance Company 984 Assistant Posts Recruitment 2017 Prelims Results announced: New India Assurance Company Limited Prelims Results For 984 Assistant Posts Declared. The New India Assurance Company Limited has announced prelims exam result for Assistant post. Candidates who had appeared for the examination can check the result at the official website at newindia.co.in. The New India Assurance Company Limited has announced the result of the prelims exam for Assistant post. Candidates who had appeared for the examination can check the result at the official website at newindia.co.in. The recruitment began in March 2017 with The New India Assurance Company Ltd., a leading Public Sector General Insurance Company and wholly owned by Government of India, invited applications from eligible Indian Citizens for recruitment of 984 Assistants in Class III cadre from open market. How to check Assistant Posts result? Results can be retrieved at the official web portal of the recruiting organisation. Candidates can download the .pdf file from the official website and check their roll number. The result list copy can also be saved for future reference. Assistant Posts Result declared, What's next?. List of Roll Numbers of Provisionally Shortlisted Candidates for Phase II Examination for the post of Assistants (Class III) - Assistant Recruitment Exercise 2016. Downloading of call letters indicating date and venue of Phase II examination will commence shortly. Candidates are advised to keep visiting the Recruitment Section of newindia(NIACL) website for further details. Marks of the candidates not shortlisted for Phase II examination will be displayed on our website soon. New India Assurance Co Ltd Assistant Recruitment Exercise 2016-17 Tier 2 Exam Result Declared: The New India Assurance Co. Ltd has declared the Tier 2 exam result of the Assistant recruitment exercise 2016-17. Qualified candidates are eligible for regional language test and document verification. 'Based on the performance in the online Preliminary and Main Examinations held on 23-04-2017 and 23-05-2017 respectively, the following candidates have been provisionally shortlisted for Regional Language Test,' reads the official notification. The regional language test will be held on 17 and 18 June 2017. Details of the exam is available at the official web portal newindia.co.in. Results are available State wise. Exam call letters have not been issued by the Company yet. Candidates can monitor the website regularly for updates in this regard. The recruitment process is being held for selecting candidates against 984 vacancies in class III cadre. The tier 2 online exam/ main exam was held in 23 May 2017. As per the official notification, the admit card for each exam will be released 10 days prior to the exam; hence the regional language test call letters can be expected soon.